Everyone strives to memorize Qur’an but very few try to memorize ahadith. 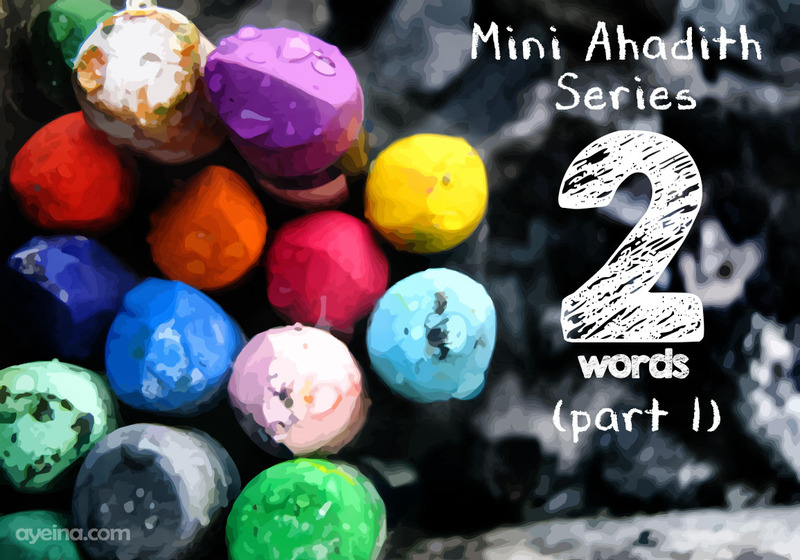 So this “Mini Ahadith Series” will help you memorize parts of ahadith (or full ahadith) one by one. We will start from two and gradually progress to more words in shaa Allaah. I have put the series in Kids corner because they are as easy for kids to learn as well. They will also help you to teach your kids a few Islamic manners and while disciplining them, you can always use the Arabic words instead, so they can get the hang of it too. Audios have been recorded by my cute little niece who is two and a half years old. Following words have been taken from these ahadith (a part of which is also talked about in Qur’an). You would basically have to memorise just one word (the first word “laa” in all of them is constant and recurring). The root words also carry meanings like – to slaughter, destroy, kill, make one’s perceiving powers dead, make one’s sound or motion to cease, despise someone, devour, blast or burn, carry or remove or shake off, to be tender or compassionate towards someone (lit., to feel for someone), lament for someone, perceive or become sensible of something, know a thing by means of any of the senses, learn a thing, know a thing certainly, to be certain or sure of something, to be eradicated or displaced, fall out or come out, fall continuously/by degrees/one part after another, break into pieces. Yes! That’s the beauty of Arabic. So many words come out of one root word. It all then depends on context and usage. The word “Tajassasu” has been derived from three root words ج س س (Jiim-Siin-Siin) which means to test or judge or scrutinize a thing, to spy or investigate or examine in order to form a judgement, inquire about or spy into a thing. 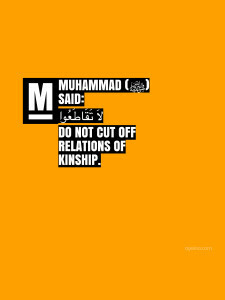 Example of this word in the Qur’an is [49:12]. The word “Tahaasadu” has been derived from three root words ح س د (Ha-Siin-Dal) which means To envy, grudge, to dislike that a person possesses a thing (and wish that it would depart from him and transfer to himself), to wish that a person be deprived of a thing. Allaah teaches us in the Qur’an, to seek refuge from the envious, in Surah Falaq. The word “Tabaaghadu” has been derived from three root words ب غ ض (Ba-Ghaeen-Dawd) which means Becoming hateful, odious or an object of hatred, fall of a good fortune. The word “Taqaata’u” has been derived from three root words ق ط ع (Qaf-Taw-Ayen) which means to cut/sever/disunite/separate/detach, to disable in prosecuting, unable to proceed in, withdraw, break down, perish/cease/finish/fail, cut short /stop, interrupted, put an end to, a piece/bit/part/portion cut off from a whole, herd, distinct portion. If you or your kids memorize these ahadith, please let everyone know in the comment section below how much time you or your kid took to learn them so others can also be encouraged to learn in shaa Allah! 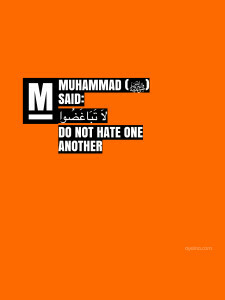 Can you also add the source of each of the Ahadith please, E.g Bukhari, Muslim, Tirmidhi etc. That would be really useful. Masha Allah, even adults could learn these. Arabic is such a beautiful and unique language. 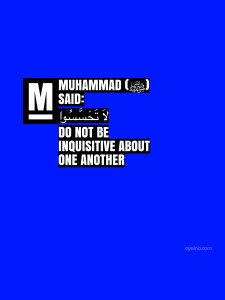 But we do not learn and memorise enough ahadith as we should. They are brilliant reminders we need in our daily life. I love the audio, Baarakallahu fih. True that. Jazakillah khair Amina for your feedback. We appreciate it. will definitely be making placards of the 4 words…jazakallahu khairan! Subhan Allah this is so refreshing! May Allah put barakah in your work and may we act according to Quran and Ahadith…aameen. Really great idea to build vocabulary! 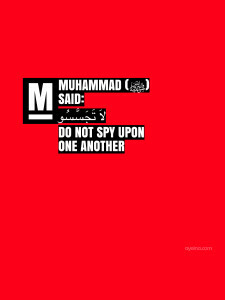 It’s great that it pulls straight from hadith, mashaAllah. Jazakallahu Khairn for sharing. I always feel blessed to be remineded of things that can truly refine my character. Jazaki Allahu khairan for this post. Could you please direct me to the printable version of these Ahadeeth?